Clean Siesta Key Beach Condo! WEELY SPECIALS: . Bright, completely remodeled 2BR/2BA condo on Gulf of Mexico's world-renowned Crescent Beach at Siesta Key (Sarasota)one of the top 10 beaches in the USA. .Sleeps 6. New furnishings, tropical theme. Beautiful view of Gulf of Mexico from living room & balcony. See photos below. Enjoy morning beach walks along white, powdered sugar sands and azure blue waters, shelling, or observe playful dolphins along the horizon nightly just as evening brings on its array of fascinating sunsets. Free trolley to Siesta Village, runs every 20 minutes, with pick up and drop off right in front of condo complex! Across the street from Capt Curt's, Daiquiri Deck diagonal from unit and other Restaurants, karaoke, tiki bar, shops, grocery, boat rental, parasailing, bike rental, ice cream, post office and drug store all within one block. Owner resides in Cincinnati Ohio and loves coming to Siesta Key for past 28 years! Reside in Cincinnati, Ohio. Husband, Ed, and I enjoy escaping to Siesta Key whenever we have an opportunity. Have been coming to Siesta Key for past 27 years and always had been looking to purchase condo here. We fell in love with our location directly on the beautiful white, powdery sands of Crescent Beach and yet, just across the street from Capt. Curt's Seafood Restaurant, Daiquiri Deck, shops, grocery, marina, drug store, post office and delightful outdoor Sniki Tiki Bar. Just 300 yds from our beach is a great area for exploring at Point of Rocks, tidal pools, exotic birds, exception shelling and snorkeling. No other complex on Siesta Key can beat our fun location. We are located just a block from the mainland bridge for easy access on and off the island, convenient location for everything, yet quiet tranquil beach. This section of Crescent Beach is the widest beach along the Gulf. Two baths, one nice large walk in shower, the guest room has tub/shower. Our 3rd floor condo unit view is from the side as shown in our condo photos. 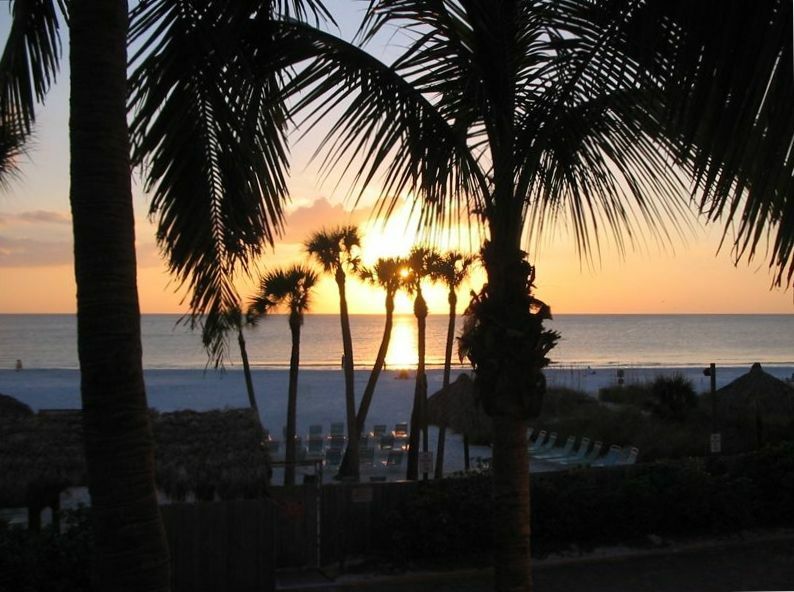 Our building is directly on the beautiful beach of Siesta Key. Part of Great Room, open area with seating for 6 with two additional stools available. This place was perfect !! Location perfect !! I have never stayed in a place more equipped in the kitchen than this place. They have lounge chairs on the beach use. The beach was amazing !!! We plan to go back next year !!! We are so glad you enjoyed your stay and look forward to you coming back! The ONLY thing that was inconvenient for us was the two key situation. A lot of the time, we were going in 3 different directions, and it was always a hassle to figure out who got keys, or how to get back in time to let someone in. We have a keypad on our door in South Carolina and we change the code with each guest - that way everyone always has a way in! Other than that, we had a great time and hope to visit again next year! Great location, condo and beach clean and relaxing. Overall, great vacation which is why we keep coming back. The property was gorgeous, clean, and in an amazing location across from Captain Curt’s. The beach was absolutely gorgeous. Would definitely recommend this property and the owner! Wonderful and responsive. We are so thankful! We loved it. Location was great. Free shuttles right across the street. Walked on the beach every morning. Kitchen was awesome, had almost every gadget you could think if, except crab crackers. Lol knives need sharpened bad! Thanks for your comments and glad you are enjoying your stay. 20 MIN. WALK N ALONG THE SHORE TO 'PUBLIC' BEACH & CONCESSIONS, 5-10 MIN. WALK S ALONG SHORE TO FUN SHELLING, TIDAL POOLS, birdwatching. Free shuttle to and from Siesta Key Village daily from 10 am - 10 pm and picks up in front of condo complex. New Daiquiri Deck across street from condo along with Capt Curt's!